In New York City, Master Splinter settles down to meditate and rest. As the Sensei begins to dream, he finds himself in the mountains of Tibet and comes upon a Yeti named T’Pau. T’Pau tells Splinter that 3 of his associates have “ceased to be” around the same time that the snowman has had visions of a strange creature that he fears is up to no good. The Yeti asks Master Splinter to help him, before he too ceases to be. 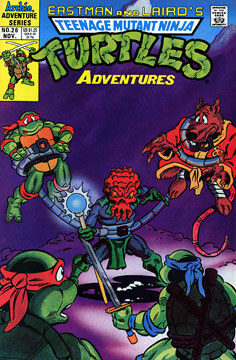 Splinter awakes and tells the Turtles to prepare to leave. The Turtles are reluctant, as April is on her way over with pizza. The Sensei grows angry with his students, and as they make their peace, all five are suddenly transported to Tibet (just beore April arrives with the food). Our heroes spot the cave entrance to T’Pau’s home and climb the mountain to get there. Inside the cavern, they find the Yeti in the robotic grasp of a strange octopus-faced alien. The Turtles attack the intruder, but he has a staff that quickly disintigrates anyone who makes a move. Splinter is the first to go, followed by Raph, Don and Leo. Mikey manages to disarm the fishy faced foe, but the creature activates a device on its writst and both T’Pau and Mike vanish. Later, Mike wakes up inside a room with T’Pau. The Turtles picks the lock on the door and the two head out to investigate. They find two guards, but Mike makes short work of them. Eventually the duo find a door and the ninja kicks it down, revealing the control center of the spacecraft. Inside are the alien, some guards, as well as Splinter, Don, Leo and Raph. The Sensei introduces the alien as Boss Salvage and he explains that he has only come to Earth to save the rare species before the planet is ruined by toxic waste. He’s already collected the Loch Ness Monster, Bigfoot and a Merman and planned to save T’Pau as well. The Yeti becomes agitated and states that while things look bad for the Earth, there is still time to save it – and in fact, many people are working hard to do so. After the snowman’s invigorating speech, Boss Salvage agrees that there is still hope. Everyone says their goodbyes and T’Pau transports the TMNT and Splinter back to the sewer, where they enjoy some pizzas with April. Contains an additional five page April O’Neil story entitled “Questions” by Dean Clarrain and Garrett Ho.